You are here: Home / Climate / Farewell Penny? "I've had it up to here!" PRIME Minister Julia Gillard is expected to bring high-flyer Greg Combet into cabinet to be climate minister, as Labor tries to rebuild credibility on an issue that helped sow the seeds of its poor performance at the federal election last month. Mr Combet, the former ACTU chief who assisted in the climate portfolio during his first term in Parliament, is seen as one of the government’s best trouble shooters, most recently in his handling of the mop-up after the home insulation debacle. His big challenge as climate minister would be to help win acceptance for a carbon price after Labor’s failed efforts to get an emissions trading scheme passed through Parliament during its first term. OK, Com-bot – it’s your turn next! Although I shiver at Combet being given in the role. There’s no leftist more capable of selling the lie than Combet. Doesn’t Greg Combet own a beach front property at Newcastle? Who needs a climate minister? We should have a commence sense minister! The truth is there is no man-made global warming. There’s only the scam of an empty global religion designed to condemn human progress and sucker the feeble minded into worldwide human misery.” (Capitalism Magazine’s Tom DeWeese). Since his department has been regurgitating the Newcastle coastline scare, we should expect him to be moving soon, eh? Bring on the next Kool-Aid drinker. 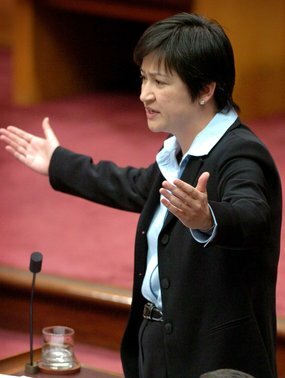 Canberra is fairly getting littered with the bodies of senior politicians who have crashed and burned after drinking the stuff: Brendan Nelson, Malcolm Turnbull, Kevin Rudd, and now Penny Wong. I couldn’t think of a better person than Greg Combet to crash and burn next. This arrogant little turd deserves everything he’s got coming to him — in spades. The sneerer in chief will be missed….not much. Combet would be the perfect robotic replacement. A machine man through and through. This move is seen as a promotion. On that logic we are to assume that he has been overwhelmingly successful in his current job as head cleaner-upperer of Garrett insulation mess. Here success is defined as no houses exhibiting spontaneous combustion, and no homeowners electrocuted for a few weeks. Goodbye Wenny PONG and good riddance to you and your lunatic climate change disciples. I would like to see you refund the Australian Tax Payer, the millions that you and your megalomaniac boss King KRUDD of Crapopoulos spent carting your harem to Copenhagen. While you are at it, take Malcolm Fraser and Malcolm Turnbull with you.